wings spread, hung out to dry. the weakness of its feet. If ever a bird had a face that only its mother could love, it’s the turkey vulture – it has more wrinkles than last year’s apple and not enough pride to cover it all up with feathers. Other than that, vultures are nice birds. Watch one soar through the air on a summer day and you’ll think that these birds invented flight. They have what’s known as “light wing loading,” meaning that their wingspread is especially large as compared to their body weight. That makes them a bit clumsy on takeoff, but once a vulture gains some altitude it can seek out a thermal and spiral up that column of rising air until it climbs high enough to locate a breeze. Then it sets its wings and soars for miles. Now, despite its relaxed appearance, the turkey vulture isn’t playing tourist; it’s actually working. When looking for dead meat is your beat, you’ve got to fly around watching for the fallen. Road kills and rotting livestock don’t turn up in every pasture or along every mile of highway; thus, the vulture needs determination and a keen sense of sight and smell. If you’re asking why vultures don’t just catch prey as do other raptors, there are a couple of reasons. For one thing, a vulture’s feet are weak in relation to its size; therefore, it can catch and carry only small prey. Also, it’s easier to eat carrion if you have the digestive system to handle it. And a vulture’s tolerance for ripe meat amazes even the experts. Botulism is a disease that we relate to improperly canned and/or bacteria infested foods, but that same disease-causing organism also inhabits rotting, decaying carcasses; so, too, do a host of other toxic organisms. 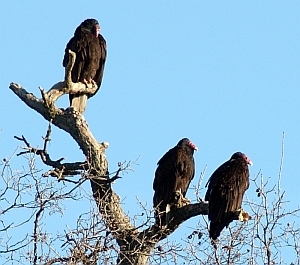 When left lying around carrion becomes a veritable disease factory, so vultures actually perform a public service by cleaning it up. In an attempt to find out how resistant a vulture is to disease, a scientist injected a bird with enough botulism toxin to kill 300,000 laboratory rodents. The vulture didn’t even become nauseous. Incidentally, ornithologists postulate that having a featherless head is a practical adaptation to carrion eating. They feel that disease organisms are probably less likely to survive on bare skin when the skin is exposed to sun and air. These bald heads produce a strange sight around a vulture roost though, especially on a sunlit morning when every fence post seems to wear a featherless-headed bird perched with its back to the sun, with wings spread. This behavior of standing around with spread wings serves a purpose. Earlier we alluded to the fact that it takes particular effort for a vulture to become airborne. By warming up its muscles the bird can lift off and flap off with greater efficiency – a bit like warming up your car engine on a chilly day. Once it gains its element – open sky – the vulture’s primary interest is finding food, and, like all raptors, it hunts by sight – by sighting dead animals and by sighting other vultures sighting dead animals. When one vulture drops down for dinner, vultures from miles around join at the table. For the most part these sociable birds get along as well when eating as when roosting. Hunting by smell is peculiar to vultures. Their sense of smell is so keen that they regularly home in on putrid flesh even when it’s completely hidden from view. Hopefully it wasn’t our odor that attracted them, but we once had an eerie encounter with vultures. We were camped at Rio Grande Village in Big Bend National Park and had decided to walk along a blufftop overlooking the river. Since we hadn’t anticipated being gone long, we hadn’t bothered with hats or water bottles, and we were so intrigued by a courting pair of zonetailed hawks that we sat down to watch. When the show ended a half hour later, we noticed three turkey vultures circling overhead. We continued to sit there, motionless. The birds flew closer but didn’t land. Perhaps they were waiting to make sure we were dead; perhaps they figured that if we sat out there unprotected in the hot sun for a while, we would soon keel over – but no, we mustn’t anthropomorphize. Even so, those birds must have been heartily disappointed when their evening’s entree stood up and walked back to the car.